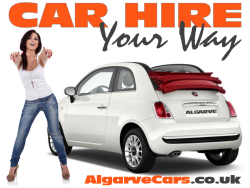 Established since 2002, AlgarveCars.co.uk provides the best service on Faro Car Hire at the lowest possible prices. Based at Faro airport we offer a cheerful meet and greet to all customers landing in Faro airport for their holidays in Algarve but we deliver our Algarve rental cars all over the Algarve to hotels	or holiday accommodation. We always try that the pick up of your Faro car hire can be the smoothiest possible with quick paperwork processing and quick delivery of	your rented Algarve car so you can start enjoying your holidays in Algarve as soon as you arrive. If you reserved your Faro Car Hire in advance it will be ready and waiting for you as you land in Faro airport and the paperwork will be quickly ready so you can drive out and start your holidays. Our Faro Car Hire cars include Third Party Insurance, Collision Damage Waiver, Unlimited Kilometers, 24h Assistance in Portugal, Road Tax and all National Taxes. Everything you need to drive safe in Portugal. Well conditioned cars from a yearly renewed Faro car hire fleet will be delivered by professional friendly staff members on your arrival to Faro international airport or to your accommodation throughout the Algarve and always at a phone call distance 24 hours a day should you need any road assistance. If you need Algarve car hire, other than Faro airport, we can deliver your car hire Algarve to holiday locations in Algarve: Albufeira, Vale do Lobo, Alvor, Carvoeiro, Lagos, Monte Gordo, Portimão, Praia da Luz, Praia da Rocha, Quinta do Lago, Tavira, Olhão, Vale do Lobo and Golf Resorts in Algarve.